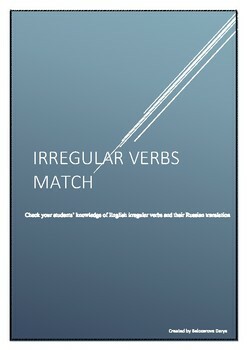 This is the matching quiz to control the students' knowledge of irregular verbs. 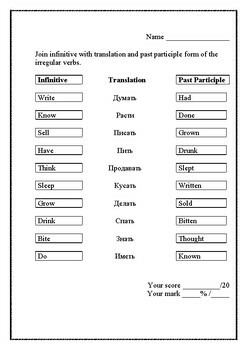 The quiz consists of matching activity and translation verbs into Russian. The quiz includes the following verbs: write, know, sell, have, think, sleep, grow, drink, bite, do. No prep needed, just print and hand out to your students. The answer key and evaluation scale are included.